Today I found out that there isn’t any difference between fur and hair; it’s all just hair. We tend to refer to a lot of animal hair as “fur”, while referring to our own hair as just “hair”. It turns out though that hair and fur are chemically indistinguishable, both made up of keratin. 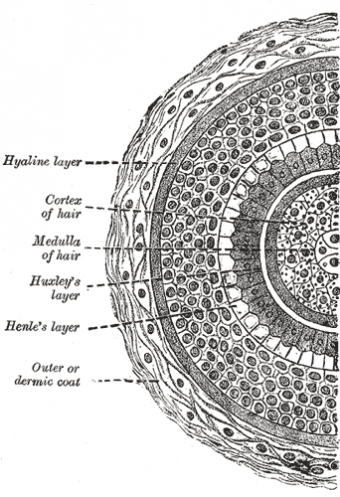 The argument that is often cited as to why there must be a difference is that human hair will just keep growing forever, while most animal “fur” stops at a set length. In fact, the latter is true, but the former is not. Human hair will stop growing after a certain period and with your scalp at least, it tends to be a longer period than with many animals, though it varies on different parts of your body. The maximum length of hair on various parts of your body is entirely determined by your genetics and varies widely from person to person and animal to animal. Each hair follicle has a period of growing and not growing. During the anagen period your hair grows. During the catagen period, your hair stops growing and the outer root sheath shrinks and the root of the hair is cut off from its blood supply and from the cells that produce new hair. This is followed by a telogen period, where more or less the follicle is resting. Eventually your hair falls out and the whole cycle starts again. For humans, a typical anagen period for your scalp hair follicles will last between 2-7 years; the resting phase, telogen, here lasts about 100 days. On your arms and your legs, the anagen period lasts around 30-45 days. This explains why the hair on your arms and legs doesn’t get that long compared to your head hair and more or less always seems to stay at a seemingly fixed length. Various mammals have different growth cycles on their hair than humans do, thus why cat hair seems to stop growing at a certain, relatively short, length; not too dissimilar from the growth rate and length of the hair on a human’s arms and legs. But in the end, hair and fur are chemically the same exact thing. There is no difference other than what we chose to call “fur” or “hair”, which is often pretty arbitrary. For instance, in many dogs with naturally short hair, it is typical to call this fur, though not always. But if the dog’s hair gets naturally long, we tend to call this hair, even though the only difference is in the length of the anagen period of the hair follicle growth cycle. Dogs such as the Poodle or Havanese tend to have a very long anagen cycle, which is why most pet owners will have their hair cut. Other dogs, such as a Labrador, have relatively short anagen periods, so their hair never gets that long. A Cat’s whiskers are also just hair. Though these hairs are attached to special nervous system connections allowing them to work as sensory receptors. During the summer, on most animals, a greater number of hair follicles will stay in the inactive tenogen period, causing the animal to shed more and have less hair. In rare cases, there are some humans whose scalp hair has anagen periods as low as a couple months. So their hair never gets more than a few inches long. In other rare cases, the anagen period can last as long as 10 years, allowing them to grow extremely long hair. For most people though, this period for scalp hair lasts only 2-7 years with the length you can grow your hair determined by the length of this period. For dogs, I’m wondering what role the “undercoat” plays, and if this is just two (or more?) layers of hair/fur (hur? fuir?) which have different anagen periods. I made this point to my wife, and she made the comment that there is indeed a difference, and the difference is genetic. I believe she’s correct, and the title of the article is misleading even though the article more or less does say that, It can still be misleading. Using the same argument, one could say that there is no difference between cats and dogs. They’re both carbon based life-forms, etc. But yes, they’re very genetically different which is clear in their appearance. So while hair and fur are not different on a chemical level, they’re very different in appearance. But if she were to look at them under a microscope, she would see that their appearance is the exact same, differing in only possibly color. Yeah, I’m silly, but thanks for the article. first of all hair and fur are different. hair is thinner than fur, also the follicle cores in fur are thicker and better for insulating the animal from the cold, are cooling it in the heat and protect from rain. hair serves none of these properties, only oil secreted over it keep rain off. hair and fur may be made up of the same materials, but they are built with different ratios, differentiating between them. its like saying that arteries and veins are the same thing because they have the same chemical compositions, even though one obviously cant do the job of the other. you could say that a car and a truck are the same thing because they both have metal, our wheels, an engine, transmission, axle, differential, but you know they aren’t. also structurally fur has a double composition, while hair has a single composition. in biology structure is function, and structurally the two are different, meaning functionally they are different. the similarities stop at them being two keratin based structures. also if you’d like to know, rhinos horns are made from keratin, are they the sam as hair or fur too? Uhm…yeah, as much as I agree with the articles on this site, with this, I’m gonna have to disagree. As cited by Joyce Melton in this comment section, hair is one layer and fur makes up 2 layers of hair hence why they are thicker. Don’t need to read this up. The distinction I have always made is that fur is made of two layers, an undercoat of shorter soft hair and a longer coat of stiffer guard hairs. I’m aware that human arms and legs actually have this distinction, it’s just not very noticeable on us since the shorter hairs are really tiny and almost invisible. Hair is hair, fur is made of two layers of hair. Humans have hair on their heads but they do not have fur on their heads despite having what is technically ‘fur’ (by this definition) on their arms, legs and backs. Poodles and some other dog breeds do not have fur in this meaning and so are not allowed to compete in certain dog sled racing events. That is MY distinction between hair and fur, not necessarily any one else’s but I find if I use the words in this way, I am always understood. Yeah, I have to ask.. if hair and fur are the same then why are poodles and havanese said to have “hair” rather than fur which is supposedly what makes them hypoallergenic? ? Some people mistakenly believe that poodles for example have hair not fur because it grows continuously but in fact it doesn’t. It has a long growth cycle and then sheds. It doesn’t shed all over your house because it gets trapped in the curly coat and must be removed by hand or the dog becomes matted. All dogs have fur – some just have a single layer and some have a double layer. Some have a very short growth cycle and some a very long one. What I don’t understand is why, while maybe they’re technically the same, hair, and only to the top of the head thins in response to testosterone (DHT) while other hair tend to thicken, then hair on sides is “neutral”. I wonder if there’s something more going on, some tenseness due to bone growth favouring toxical buildup and no drainage of Dht. As there’s no reason for which hair on sides should be immune. Ok I admit it’s speculation and I’m open to any explanation. Some transplanted people seem to be losing hair as well. And people who bald severely also tend to have more thinning on sides as well than those who don’t.